Get set for great cutting! The Basics Set from Jaguar Scissors is perfect for students, new stylists or those simply looking for a good quality set of tools with a great look and a very attractive price. Jaguar Pre Style Ergo—5.5-inch scissor with a classic design featuring ergonomic, even handles for a traditional feel. Matching thinner with 28 teeth. Jaguar Pre Style Relax—5.5-inch scissor with offset handles featuring a short thumb handle for a relaxed hand position and reduced fatigue. Matching thinner with 28 teeth. 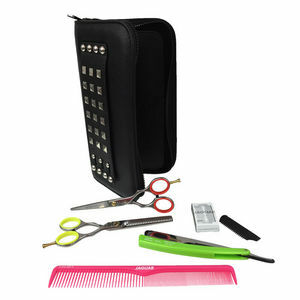 Effect case—zip-up scissor case with slots for all your tools and a hand strap decorated with cool metal studs. £108.00 (inc. VAT) Why no VAT? We're a trade wholesaler and quote our prices without VAT to help our VAT-registered customers understand the true cost of a purchase. Aluminium spray bottle with an ultra-fine micro mister and super-smooth trigger action that's creates a mist so fine it's almost weightless. Capacity is 160 ml. Measures 17-cm high.